Summer Camp: Thunder Ridge utilizes the Adventure Track system to deliver a high-quality program to the participants at camp. Adventure Tracks are a tactile, experience-based method of learning and achieving merit badges and rank advancement skills. Each track can be customized with a morning and afternoon session. Camp will not only offer specific merit badge instruction but will engage the participants in other camp program features such as C.O.P.E. (high ropes course and leadership games), skills, games and fun activities. Scouts will have the opportunity to exercise leadership and teaching skills along the path of track adventures. Leaders will also have the option to attend Leader-Specific Training and Introduction to Outdoor Leadership Skills. Want to learn more about the camp's programs? 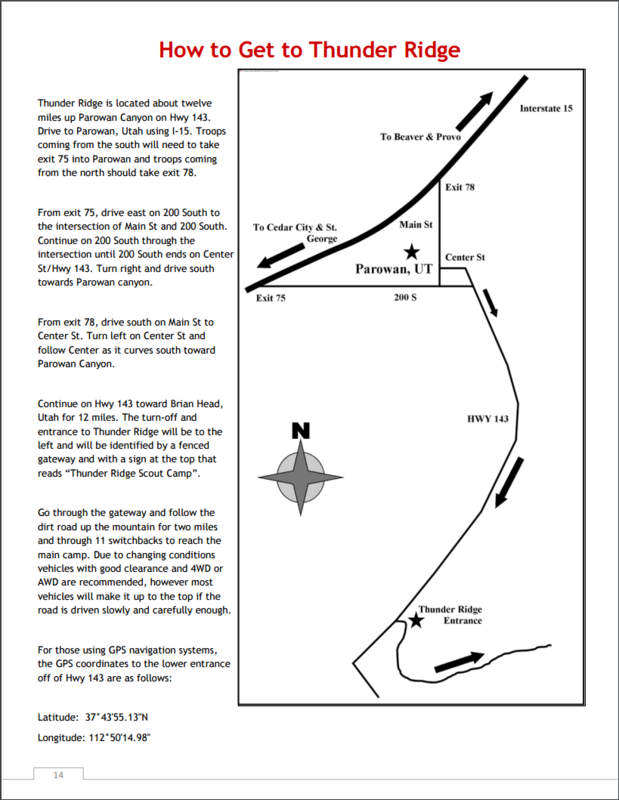 Click here for the Thunder Ridge Program Guide. Don't know how to Register? Click here for instructions. Stake / Ward Activities: The Boy Scouts of America, Utah National Parks Council now offers its properties, equipment, experts, and program for use by Church stakes and wards. As part of the 100+ year partnership between the Church of Jesus Christ of Latter-day Saints and the Boy Scouts of America,Church Stakes and Wards may utilize these BSA resources to accomplish their objectives and control their own outcomes. Prices and programs are customized to fit church interests at any of our Council properties. Year-round Camping: Are you in charge of your family reunion this year? Don't worry, Camp Thunder is an easy and beautiful place to host your family reunion. Check out other ways to utilize our camp! Register before November 1, 2018, for a $10 per youth discount. Register for week 4 (July 8-13) or 5 (July 15-20) for an additional $10 per youth discount. See 'What We Offer' and click on the activity that you are interested in. What are the camp's policies and procedures? Click here to download the Council Camp Leader's Guide, (PDF). Click here to download a map to Camp Thunder Ridge. How old do youth need to be to come to camp? Thunder Ridge offers programs for youth 11-18 years of age. How many leaders do we need to bring to camp? Two-deep leadership is required at all times. We recommend 1 leader for every 6-8 youth. As leaders, you may need to adjust this to accommodate the needs of your youth. 9. What time is check-in? Leave the food hassle to us! Come enjoy our new dining experience. 11. Is water available at camp? Potable water is available throughout the camp. 12. Do I need to bring anything else to camp? Encourage your youth and leaders to be in uniform. Other helpful items to have at camp are sunscreen, bug spray, hats for everyone, water bottles, a jacket or coat in case of inclement weather, sunglasses, a day pack to carry your items, and Scout Handbook. There is a complete gear list in the Leader's Guide (see below). 13. Will the Trading Post be open? If so, what type of things will they have there? The trading post will be open at various times during your stay at camp. We stock various candies and drinks as well as pocket knives, crafts, flashlights, camp shirts, and other souvenirs. Contact Customer Service at 801-437-6222 or email at help@utahscouts.org.